The Haitian community is preparing for the 222nd anniversary of the Bois Caiman Ceremony. The ceremony is celebrated to mark a remarkable event which gave birth to the first ever black republic in the world. 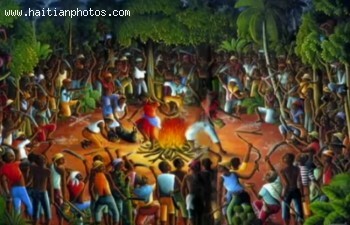 Bois Caiman Ceremony first celebrated on the 14th day of August 1791 remains a symbolic event in the history of humanity. In reminder to the Haitian people Lesly Condé expressed his expectation for good participation from the Haitian Community during this important event. Lesly is the Consul General of the Republic of Haiti in Chicago. Royal Marketing sponsored and hosted the Royal National Genius college competition during Easter week of 2013. The competition, in its 12th year of existence, seeks to create standards of excellence within the ranks of young people pursuing their higher-education goals. This year schools from five departments of Haiti participated in the week-long battery of testing to vie for the Royal National Genius title. Preceding the finals of the competition, Royal Marketing held preliminaries. Teams made up of eight students each were tested for their expertise in math, science, history, and social studies. In addition, they were also asked questions about current events at the local, national, and international levels.